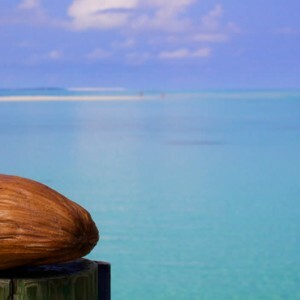 If you envision spending your honeymoon in a breath-taking tropical paradise complete with stunning accommodation, high standards of hospitality, delectable dining and plenty to see and do, then Kuredu is the place for you! 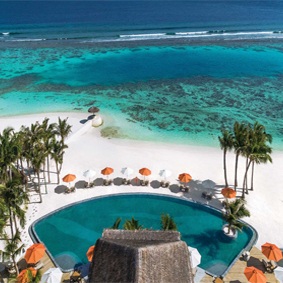 Located on its own picturesque tropical island in the Lhaviyani Atoll of the Maldives, Kuredu Resort and Spa provides visitors with an exotic sanctuary complete with soft ivory sands, sparkling water and lush green vegetation. 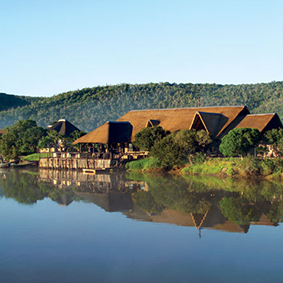 There are a variety of accommodation types available, an impressive selection of wining and dining options, and so many unforgettable experiences just waiting for you to try them, whether you are keen on scuba diving, golf or pampering spa treatments. 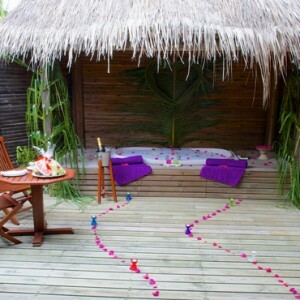 Kuredu also provides plenty of opportunity for romance, with special dinners and other romantic treats on offer. 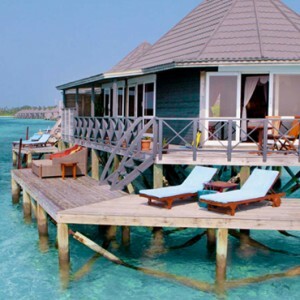 There are 9 categories of accommodation provided by Kuredu, consisting of both bungalows and villas, located on land and poised above the tranquil waters of the ocean. With 287 sqm of living space, these villas offer plenty of privacy, surrounded by lush greenery and are moments from the resort’s main areas. 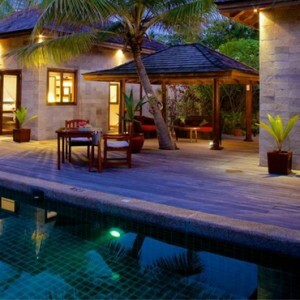 Each villa features a private pool, outdoor space with sitting area, sunbeds and shaded area. 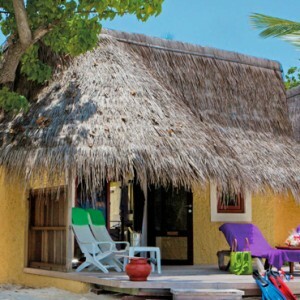 Inside you will find a four poster bed, mini bar and wine fridge, TV, Jacuzzi bathtub and tea and coffee facilities. 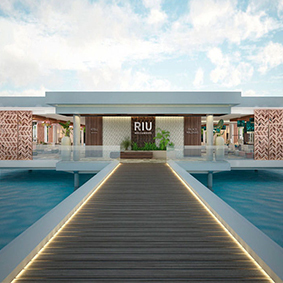 These spacious retreats for the family offer 313 sqm of living space, designed for relaxation for everyone with a lush 40 sqm private pool, patio with sitting area and sunbeds. 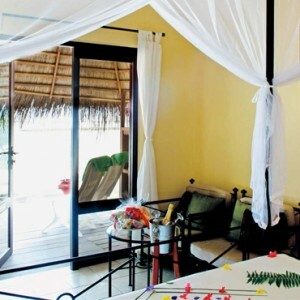 Inside enjoy modern amenities such as a four poster bed and a Jacuzzi bathtub in your bathroom. 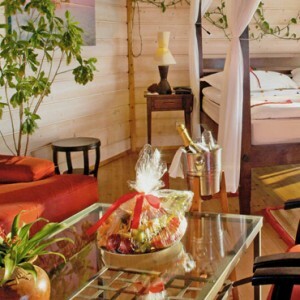 Other amenities include a mini bar and wine fridge, TV, Jacuzzi bathtub and tea and coffee facilities. 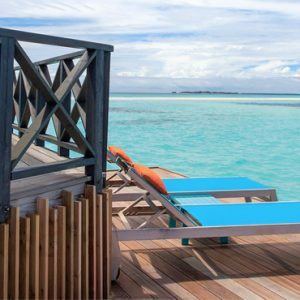 Perched on wooden stilts above the azure waters, these adults-only villas are the epitome of romance and tropical luxury, affording you magical sunset views. 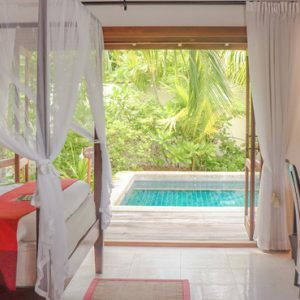 As well as stunningly furnished interiors they also feature private verandas with steps leading down into the water so you can take a refreshing dip whenever you fancy. 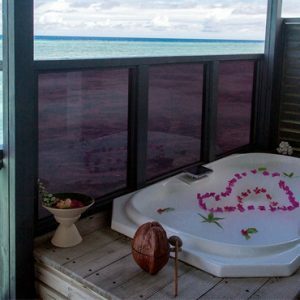 For the most lavish experience opt for the Sangu Water Villa Suite which includes an outdoor Jacuzzi bath tub among its luxuries. 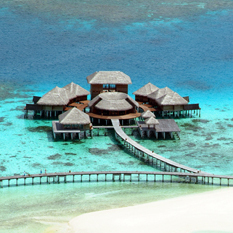 Poised over the turquoise waters, these romantic villas designed for honeymooners offer 125 qm of opulent living space and feature a relaxing veranda with private Jacuzzi to enjoy together. 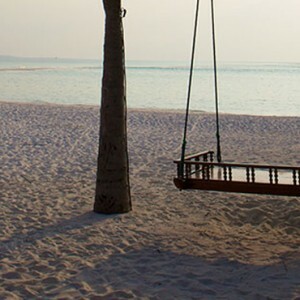 Enjoy gorgeous views of the beach including the stunning sandbank and breathtaking sunset views. 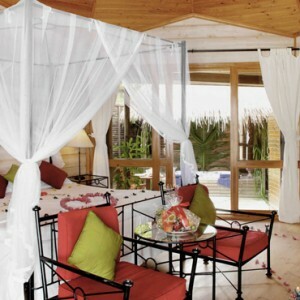 Inside enjoy the four poster bed, wine fridge, TV, mini bar and tea and coffee facilities. 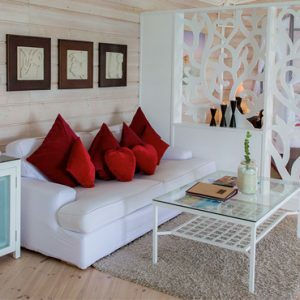 All of these elegant villas are 78sqm in size and are thoughtfully designed and furnished with an array of upscale amenities including a four-poster bed, Nespresso coffee machine, Jacuzzi tub, wine fridge and furnished terrace with sunbeds. 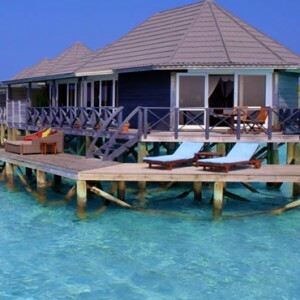 Part of the ‘O’ resort section of Kuredu on the north-eastern shore of the isle, these super-stylish villas are ideal for guests seeking seclusion and romance. 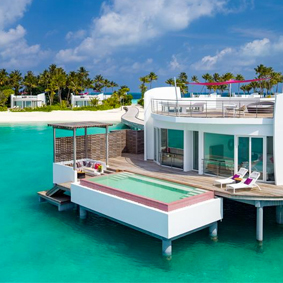 All villas come with a king-sized bed, a terrace with daybed, a flat-screen TV and Nespresso machine among their amenities. 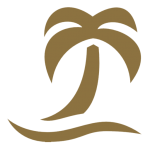 Located in a prime position on the island’s main beach, these villas ensure spectacular ocean and sunrise views as well as easy access to the pristine waters lapping the shore. 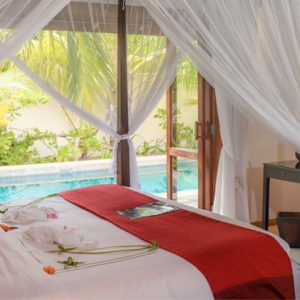 Measuring 57sqm in size, each villa is home to a furnished veranda with sunbeds, a romantic four-poster bed and a selection of cutting-edge technology. 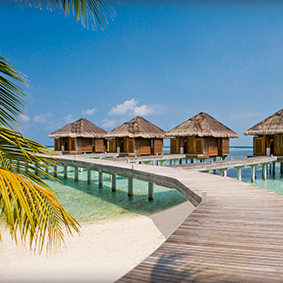 Tucked away among the lush greenery on the island’s quiet northern shore, you will find the Bonthi Beach Bungalows. 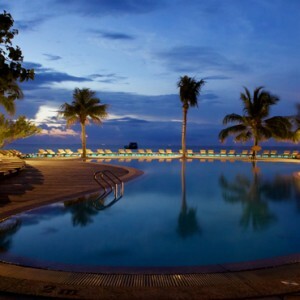 Offering affordable luxury and all the comforts of home, these tranquil getaways come with open-air bathrooms, rattan furnishings, and delightful outdoor seating areas. 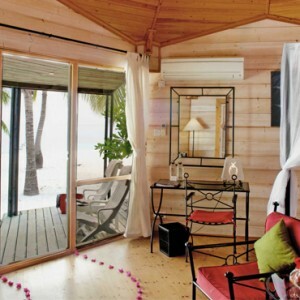 Simple but stylish, and surrounded by bright tropical gardens, these 54sqm bungalows will provide you with a cosy sanctuary on your Maldives honeymoon. 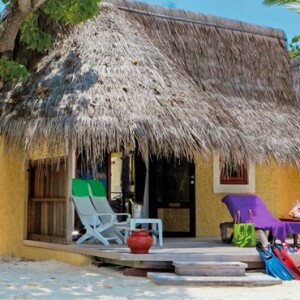 All bungalows come with plush queen-sized beds, a mini bar and Nespresso machine, and a furnished veranda with sunbeds. 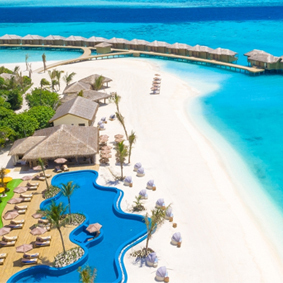 The facilities at Kuredu are truly outstanding and ensure guests have plenty to see and experience during their time on the island. 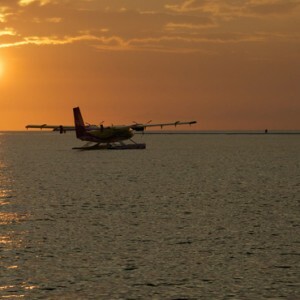 Thanks to its sparkling cerulean waters and house reef, Kuredu is the ideal place to spend plenty of time in the water, getting up close to the local marine life. 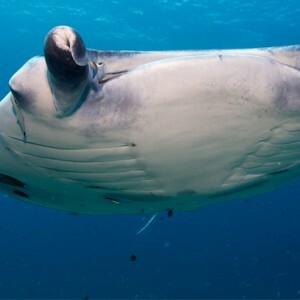 Honeymooners can go snorkelling and scuba diving with Prodivers, the isle’s PADI 5 Star Dive Centre, which offers lessons, excursions, house reef diving and more. 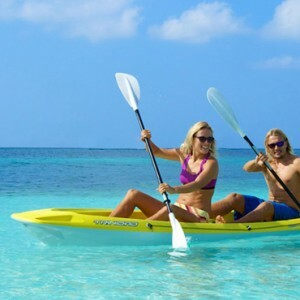 Various thrilling water sports are available too, as Kuredu is home to the biggest water sports centre in the archipelago, Ocean Watersport. 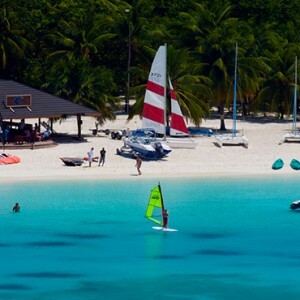 Wake boarding, water skiing, parasailing, catamaran sailing and canoeing are just some of the fun-filled activities on offer. 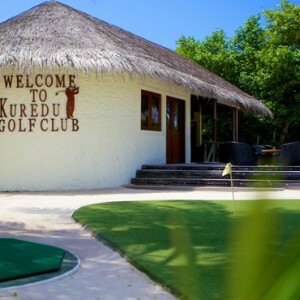 Couples who want to try something a little more relaxing during their time on Kuredu will appreciate the Kuredu Golf Club, where enthusiasts can tee off among lush tropical surroundings and perfect their technique on the driving range or the putting green. 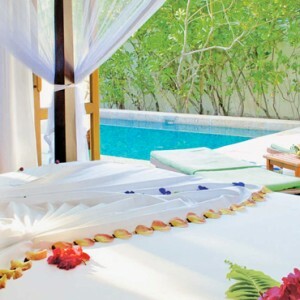 Alternatively you can unwind in even more blissful fashion with a visit to the Duniye Spa. 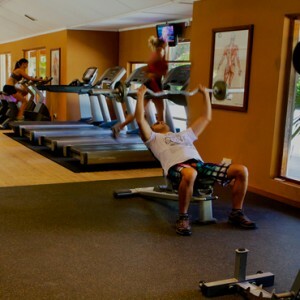 This top-notch wellness facility has two locations, one on land and one poised over the water. Whichever one you choose you will be able to enjoy a decadent pampering. 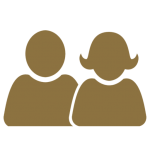 Be sure to try one of the sensual couples’ options, such as the Honeymoon Indulgence or Full Moon Magic. 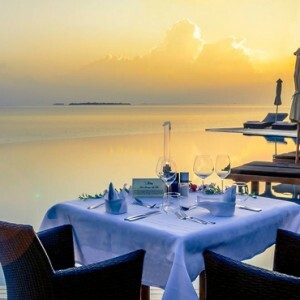 There is an impressive selection of restaurants and bars located on Kuredu, promising an alluring selection of culinary journeys guaranteed to make your mouth water. 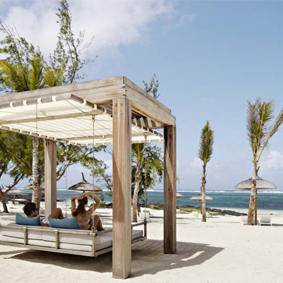 Tuck into delicious seafood and vegetarian dishes at the Beach Shack, which offers dishes on the menu that are locally-sourced and sustainable. 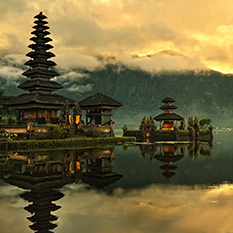 Couples who can’t wait to experience the sumptuous flavours of the Far East will love this teppanyaki and a la carte dining venue. Watched skilled chefs prepare your meal and then feast on such delicious dishes as sushi, sashimi, gyoza dumplings, tempura, teriyaki and various curries. 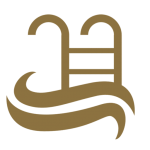 If you love the fresh flavours of Mediterranean cuisine then Franco’s is definitely the place for you. 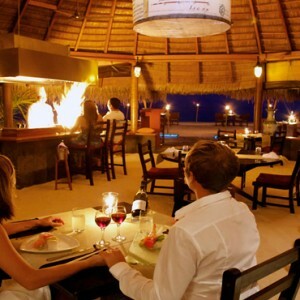 Serving up the best pizza in the Maldives, as well as an alluring menu of other equally enticing delicacies, Franco’s is also a great spot to enjoy a romantic meal under the stars with your new spouse. 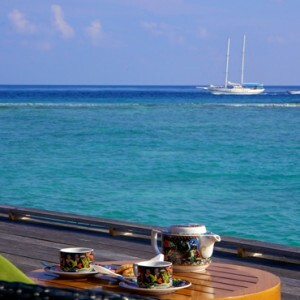 As well as the al a carte options, Kuredu is also home to 4 main buffet venues: Sangu, ‘O’, Koamas, and Bonthi. 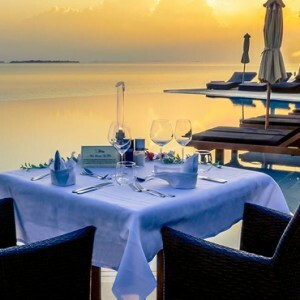 Each restaurant boasts its own unique merits but all four dish up a wide variety of local and international delicacies, including themed dishes sure to titillate your taste buds. 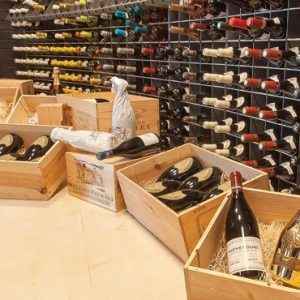 This indulgent wine cellar has over 1,100 premium and exclusive wines. 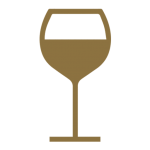 Celebrate a special occasion with a wine tasting session in style at the Wine Cellar. 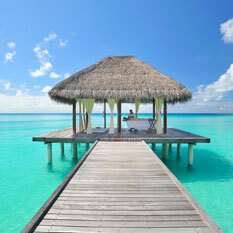 Cool off from the Maldivian sun with at Island Ice, which serves delicious frozen treats in an al fresco setting.